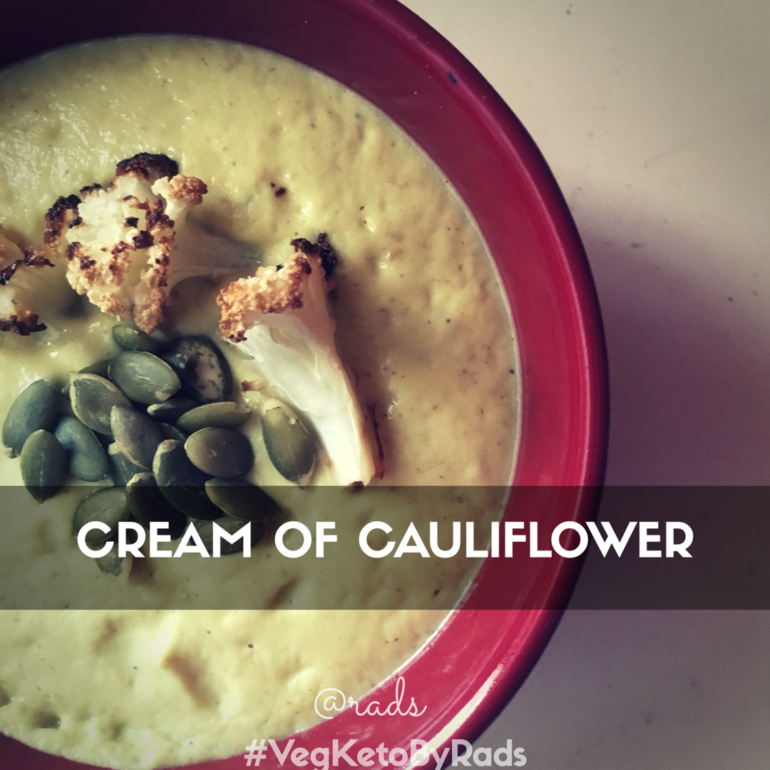 This cream of cauliflower soup has all the goodness of cauliflower AND healthy fats coz of coconut! 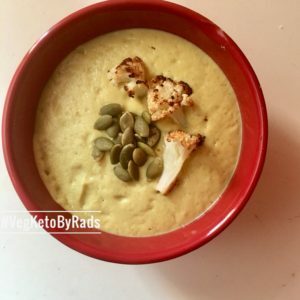 Cauliflower is the HOLY vegetable for all who’ve adopted the low carb or keto lifestyle. It’s hardy, cooks quick, versatile AND but of course it’s low carb. There are plenty dishes one can make with cauliflower that fills and satisfies both, your tongue and the body. 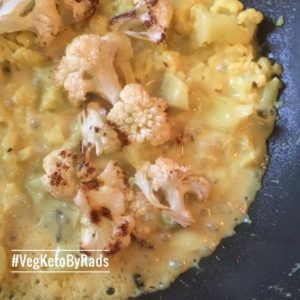 If you needed any more proof, check the macros out for the cauliflower. Ive made this soup a couple different ways, and it’s pretty foolproof. 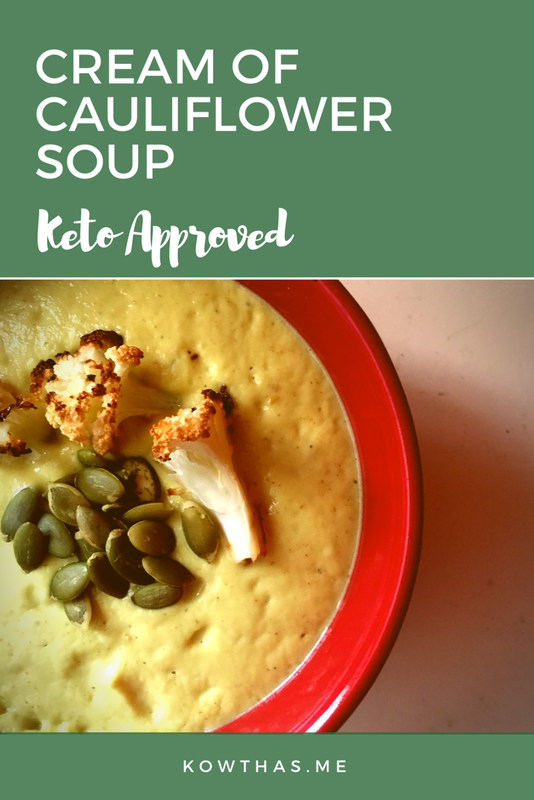 The coconut milk is super creamy and it blends so easily and quickly with cauliflower. A few have made this with raw cauliflower, but I have never enjoyed the taste and smell of raw cauliflower, so I cook it. Occasionally, when I have the time, I have roasted it in the oven, but mostly I cook it on high on the pan. It works fine both ways, though am sure there are subtler factors at play and the taste may change a wee bit. With that said, this cream of cauliflower soup is so easily done with just the basic two ingredients. The rest add flavor and enhance the soup with some goodness and spice levels. It’s perfect for the winters, and since we are STILL in the winter and SPRING IS NOWHERE TO BE SEEN DESPITE IT BEING MARCH 21ST, I decided to make a pot of it. Munchkin is also staying home and she loves new foods, so this was our lunch. Preheat oven to 375F. Douse 10 medium sized florets with coconut oil and a pinch of salt, and roast them in the oven for about 25 minutes, till the edges look brown and are thoroughly cooked. In a large saucepan, add 1 tbsp of coconut oil or ghee, add the garlic and rest of the florets and saute for a couple minutes. Add the can of coconut milk. Fill the empty can with water, and add that in as well. Add turmeric, pepper and that ginger and mix it well. Shut it, and let it cook together for 15 minutes on medium heat. Check if the cauliflower is cooked through, and remove from heat. Remove the roasted cauliflower from the oven once its cooked through and empty half of it into the pan, and let the rest cool for garnish. Once warm to the touch, use a handheld blender and blend it together. Or you could use a regular blender and churn it quick. I use Blendtec and the soup setting is a heaven sent. If the soup is thick, you may add a wee bit of hot water to thin it. If it’s too thin, you could add some cream or more coconut milk. How is this even Keto? Cauliflower is low carb. Check nutrition label above. Coconut Milk and coconut oil/ghee brings the fat in. Please calculate your own macros – this is just a guideline. Is there a way to make this less fat? But of course! Reduce the coconut milk to 1/2 can and substitute with vegetable stock or water. To thicken, use roux (a tsp of flour mixed with a tsp of butter and whisked together on a hot pan) or heavy whipping cream, or just let it cook longer. Making Cauliflower Rice is simple! 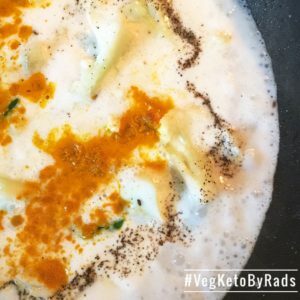 I am on Pinterest and I obsessively collect Keto Recipes there. Check it out and let’s connect?